Background: Cutaneous endometriosis occurs in a surgical scar following abdominal or pelvic procedures. The incidence of scar endometriosis has been estimated to be only 0.03-0.15% of all cases of endometriosis. The tendency to use routine laparoscopic inspection of the pelvis to exclude concurrent pelvic endometriosis has been applied extensively over the years. Aim of the study: The aim of this study was to investigate if patients with cutaneous endometriosis should always undergo laparoscopy to exclude pelvic endometriosis. Material and methods The study included women presenting with a history of painful nodules at either the umbilicus, a midline incision or at the level of a Pfannenstiel scar, following gynecological or caesarean section procedures. The lesion may have been slightly tender around the time of menstruation. Bleeding from the umbilical or scar nodule during or after menstruation was also described by some patients. The study began in January 2010 and ended in December 2016. All patients underwent umbilical or scar nodule biopsy confirming the presence of endometriosis before the diagnostic laparoscopy took place. Results: Fourteen patients with cutaneous (scar) and umbilical endometriosis attended the clinic during the study period. Out of these, only eight cases (47.2%) met the inclusion criteria of scar endometriosis clinically and underwent diagnostic laparoscopy. The mean age was 35.6 years (29-47) and mean parity was 1.5 (0-3), with a history of previous pelvic surgery or caesarean sections. Biopsy of the lesion confirmed the presence of endometrial tissue (gland and stroma) and haemorrhage. Diagnostic laparoscopy, after the excision of umbilical or scar endometriosis, revealed no pelvic endometriosis. Conclusion: A laparoscopy to exclude pelvic endometriosis should not be undertaken in patients who present with scar endometriosis, as there is a potential risk of introducing endometriosis into the pelvic cavity. Endometriosis is defined by the presence of functional endometrial glands and stroma outside of the endometrial cavity. It is a common gynecological condition that affects up to 22% of all women (8-15% of women of reproductive age and 6% of premenopausal women) [1,2]. The etiology of endometriosis remains unclear. It is considered to be a “disease of theories” with its pathophysiology being only partially understood. Endometriosis usually occurs within the pelvic cavity. Common locations are the uterine wall, the fallopian tubes, the ovaries, and the pelvic peritoneum [3- 5]. Pelvic endometriosis presents clinically with a triad of symptoms: pain (chronic pelvic pain and dysmenorrhea), menorrhagia, and infertility. Extra pelvic endometriosis affects up to 15% of patients and can be found in almost all the organs (such as bowel, bladder, pericardium, pleura, and even the brain). Extra pelvic endometriosis has a variety of signs and symptoms depending on the location [6-8]. Cutaneous endometriosis is very rare and is related to previous gynecological surgery. It is characterized by the presence of pigmented umbilical nodules associated with cyclical pain or bleeding during or immediately after menstruation. There is an estimated incidence of 0.03-0.15% of all cases of extra genital endometriosis [9,10]. Cutaneous endometriosis of the abdominal wall may occur due to direct seeding after laparotomy or laparoscopy . The theory of lymphatic or vascular dissemination is favored in the case of umbilical endometriosis with coexisting pelvic endometriosis [12,13]. 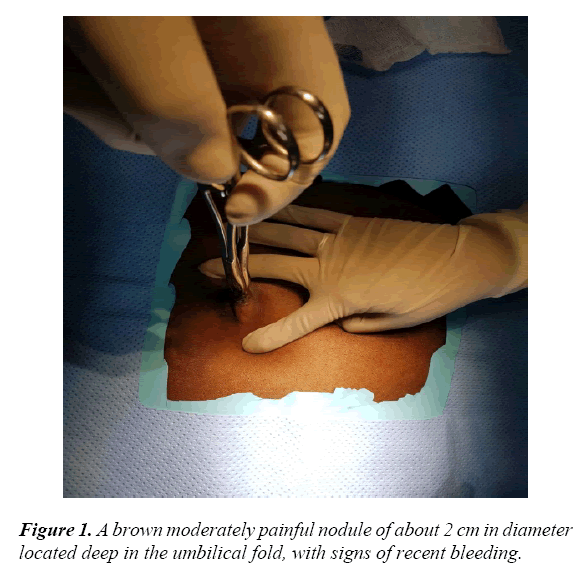 The study included women presenting with a history of painful incisional scar or umbilical nodules or bleeding from the umbilical or scar nodule during or after menstruation in the patients with a history of previous pelvic surgery. Women who presented with the above symptoms in the absence of previous pelvic surgery for either gynecological disorders or caesarean section were excluded from the study. The study took place at a tertiary institution in South Africa in the pelvic floor and endoscopy unit at the University of the Witwatersrand between January 2010 and December 2016. Prior history was taken from all patients followed by clinical examination. Vaginal ultrasound was performed in order to exclude any pelvic pathology. Abdominal ultrasounds were performed to assess the cutaneous mass. Biopsies of the lesion were performed in all the cases. MRI was undertaken in cases where the umbilical mass or previous scar tissue was fixed to the anterior abdominal wall during abdominal examination, or was found to be connected to the fascia during abdominal ultrasound. MRI was performed in order to assess the depth of the lesion, specifically in relation to the fascia and peritoneum. All cases with confirmed cutaneous endometriosis were admitted for a wide excision of the lesion, as well as diagnostic laparoscopy for the assessment of pelvic endometriosis. Out of the 14 cases with cutaneous (scar) and umbilical endometriosis that were referred to the unit during the study period, only eight cases (47.2%) fulfilled the criteria of the study. The mean age of the patients included was 35.6 years. Patient characteristics are shown in Table 1. All eight patients presented with a dark brown nodule on the umbilicus or incisional scar for a period between six months and four years (mean of 18 months) associated with cyclical pain during or immediately after menstruation. Three of the cases reported a bloody discharge from the umbilicus during menstruation (Table 1). Six out of the eight patients (75%) had previous caesarean section. Four cases with midline incision, where the nodule was at the level of the umbilicus, two cases with Pfannenstiel incision, who presented with a painful nodule along the transverse scar. Of the remaining patients, one had a previous history of myomectomy and the other a laparotomy for uterine repair following uterine perforation during evacuation of the uterus. In all patients there was a lack of lower abdominal pain (dysmenorrhea or secondary dyspareunia). Infertility was not a reason for presenting to clinic. Per vaginal examination and transvaginal ultrasound revealed no apparent gynecological pathology or presence of endometriosis in seven out of eight patient. One patient during vaginal ultrasound was found to have a thick walled ovarian cyst of mixed echogenicity, measuring 4 × 4 cm on the left side. Abdominal ultrasound revealed the presence of a hypoechoic superficial mass in seven out of the eight cases. One of the cases with previous Pfannenstiel incision nodule underwent MRI to determine the depth of the lesion in relation to the fascia, as the lesion on abdominal palpation was found to be fixed. Biopsy of the mass was performed for all cases. Histology revealed the presence of functional endometrial tissue (gland and stroma) and associated haemorrhage. All cases underwent wide excision of the lesion under general anesthesia, followed by laparoscopy that served to confirm that cutaneous endometriosis was not associated with pelvic endometriosis. The patient with the ovarian cyst underwent laparoscopic cystectomy. Histology revealed the presence of a haemorrhagic corpus luteum cyst and not ovarian an endometrioma as was expected. The follow-up period ranged from six months (since the last case entered the study) to six years (since the first case entered the study), with a mean follow-up period of 36 months. Cutaneous endometriosis of the abdominal wall is a rare condition and most commonly it occurs in scars after gynecological surgery or caesarean section. When cutaneous endometriosis occurs in the absence of surgery, it is known as primary or spontaneous cutaneous endometriosis. The most common location is the umbilicus, hence the term Primary Umbilical Endometriosis (PUE). In the presence of previous pelvic surgery, umbilical endometriosis should be defined as cutaneous or secondary umbilical endometriosis. This is more common than PUE and is most likely due to iatrogenic direct seeding of endometrial cells either during laparoscopic or open surgical procedures . In the case of umbilical endometriosis with coexisting pelvic endometriosis, the theory of lymphatic or vascular dissemination is favoured . The etiology of PUE still remains unclear, despite several etiological theories having been proposed. These include coelomic metaplasia of the urachus remnant, direct extension through the round ligament or congenital presence of developmentally displaced endometrial tissue. Cutaneous endometriosis of the anterior abdominal wall has an estimated incidence of 0.03-0.15% of all cases of endometriosis [11-13]. It is characterized by the presence of pigmented umbilical nodule of varying sizes, from a few millimeters to a few centimeters, which are associated with cyclical pain or bleeding during or immediately after menstruation (Figure 1). Figure 1: A brown moderately painful nodule of about 2 cm in diameter located deep in the umbilical fold, with signs of recent bleeding. The mean age of presentation in our study was 35, 6 years with the youngest patient being 23 years of age. This is in keeping with the review performed by Victory and co-workers who also found that the youngest patient in their series was 23 years old . Cutaneous endometriosis involving the abdominal wall is commonly associated with surgical scars . Six out of 8 cases with histologically proven scar endometriosis were found to have a previous history of caesarean section and two with gynaecological surgery. All cases had resolution of symptoms following excision of the lesion. All eight patients that were included in this study had no clinical history suggestive of pelvic endometriosis and no infertility issues. Cyclical pain with a palpable mass is the most commonly presenting symptom of this condition. In our study, all patients had these classical cyclical symptoms. In spite of this, the diagnosis was delayed by an average of 18 months (range 6-48 months). Delay in diagnosis can be explained by the fact that our patients visited several doctors, both general practitioners and specialists in local clinics and the private sector, before deciding to have a biopsy of the lesion in at our institution. Histology is the mainstay of diagnosis of umbilical endometriosis, as it is important to exclude other pathologies such as malignant melanoma, the “sister Joseph nodule”-a manifestation of intraabdominal malignancy- or other dermatological conditions. MRI is the most accurate method used to determine the depth of the lesion, specifically in relation to the sheath and the peritoneum. This is an important step when the excision of the umbilical nodule is undertaken. One out of the eight cases with scar endometriosis underwent MRI, which revealed that the umbilical nodule was penetrating the fascia. There is no standard management regime for cutaneous endometriosis, as there is a limited amount of cases available on the topic. Medical management using progesterone, danazol, norethisterone, and gonadotropin-releasing hormone (GNRH) analogues have not shown reliable results. However, some authors have reported success in relieving the symptoms and reducing the size of endometrial nodule using medical hormonal treatment [2,15]. All the cases in this study underwent complete removal of the umbilicus, with total excision of the endometriosis lesion, obtaining an adequate rim of normal tissue all around in order to avoid local recurrence (Figure 2). Reconstruction of the umbilicus was performed in all cases (Figure 3). One case underwent repair of the underlying fascia and peritoneum. Our study is comparable to other studies [1,4,16-18] that have shown that total excision of the lesion is associated with no recurrence during follow-up. The mean follow-up period for our cases was 36 months. All cases included in the study underwent diagnostic laparoscopy. No pelvic endometriosis was found during diagnostic laparoscopy. This is akin to other authors who have suggested that there is no need of laparoscopic assessment in cases of cutaneous endometriosis of the anterior abdominal wall [4,9]. The possibility of coexisting pelvic endometriosis should be investigated by postoperative follow-up. 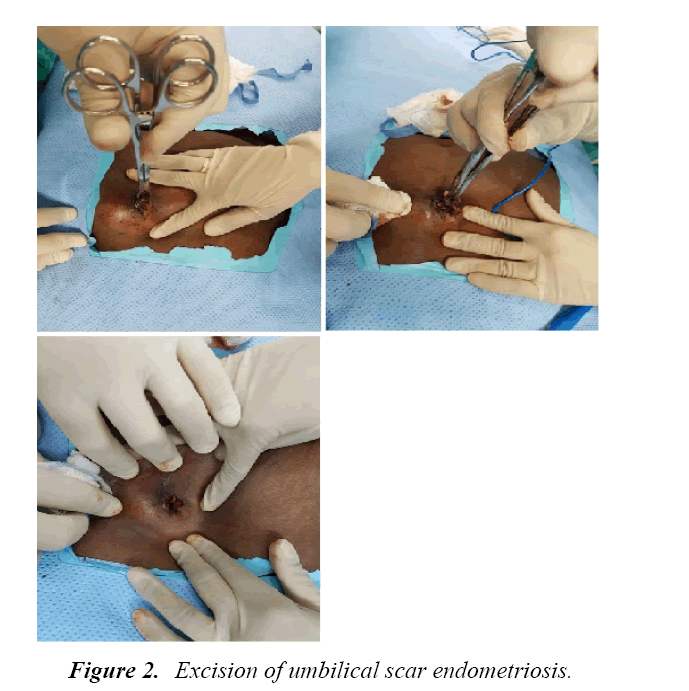 Figure 2: Excision of umbilical scar endometriosis. Figure 3: Complete reconstruction of the umbilicus. Cutaneous endometriosis is an increasingly diagnosed and reported condition. The primary physician should be aware of this condition to help in early diagnosis and treatment. In patients with scar endometriosis following gynecological procedure, laparoscopy to exclude pelvic endometriosis should not be undertaken. There is a potential risk of introducing endometriosis into the pelvic cavity, as well as a risk of exposing the patient to prolonged operating time, unnecessary interventions and their potential complications. Complete excision prevents recurrence and should be offered even if it results in facial defects requiring primary closure. No conflict of interest for any of the authors. Spaziani E, Picchio M, Di Filippo A et al. A spontaneous umbilical endometriosis: A case report with one year follow-up. Clin Exp Obstet Gynecol. 2009;36(4):263-64. Paolo R, Silvia P, Chiara C, et al. Endometriosis of umbilical cicatrix: Case report and review of the literature. Acta Dermatovenerol Croat. 2000;16(4):218-21. Catalina-Fernandez I, Lopez-Presa D, Saenz-Santamaria J. Fine needle aspiration cytology in cutaneous and subcutaneous endometriosis. Acta Cytol. 2007;51(3):380-4. Argawal A, Fond YF. Cutaneous endometriosis. Singapore Med J. 2008;49(9):704-9. Pramanik SR, Mondal S. Primary umbilical endometriosis. J Hum Reprod Science. 2014;7(4):269-71. Kaushik R, Gulati A. Inguinal endometriosis: A case report. J Cytol. 2008;25(2):73-4. Wolf G, Singh K. Caesarean scar endometriosis: A review. Obstet Gynecol Surv. 1989;44(2):89-95. Medeiros FC, Cavalcante DI, Medeiros MA, et al. Fine needle aspiration cytology of scar endometriosis: study of seven cases and literature review. Diagn Cytopathol. 2011;39(1):18-21. Francisa G, Giardiello C, Angelone G, et al. Abdominal wall endometriosis near cesarean deliveries scars. J Ultrasound Med. 2003;22(10):1041-7. Kaloo P, Reid G, Womg F. Cesarean section scar endometriosis: Two cases of recurrent disease and literature review. Aus NZ J Obstet Gynecol. 2002;42:2018-20. Konichky PR, Donders G, ven Decruys H. Umbilical endometriosis after unprotected removal of uterine pieces through the umbilicus. J Am Assoc Gynecol Laparosc. 2000;7(2):727-32. Friedman PM, Rico MJ. Cutaneous endometriosis. Dermatol Online J. 2000;6:8. Igawa HH, Ohura T, Sugihara T, et al. Umbilical endometriosis. Ann Plast Surg. 1992;29:266-8. Victory R, Diamond MP, Johns DA. Villars nodule: a case report and systematic review of endometriosis externa of the umbilicus. J Minim Invasive Gynecol. 2007;14(1):23-32. Tech WT, Vollenhoven B, Harris PI. Umbilical endometriosis, a pathology that a gynecologist may encounter when inserting Veres needle. Fertil Steril. 2006;86(1764):el-2. Bagade PV, Giurguis MM. Menstruating from the umbilicus as a rare case of primary umbilical endometriosis: A case report. J Med Case Rep. 2009;3:9326. Dadhwal V, Gupta B, Dasgupta C, et al. Primary umbilical endometriosis: a rare entity. Arch Gynecol Obstet. 2011;283:119-120. Geranpaye L, Fadaei-Araghi M, Irani S, et al. Spontaneous endometriosis of the anbdominal wall. Acta Medica Iranica. 2009;47(2):154-6.